Ever sat spinning the reels wishing that you had a magic wand to wave and cast a spell that every spin you make will be a winning one? Yes, me too, and while that dream may be a figment of our imagination, it moves a little closer to reality with the mystical Winning Wizards slot machine. Wizards are mystical figures who are said to possess magical powers that they use to either help people or harm them so you better be in a good mood when you meet this Wizard or he could cast a spell that will never see you win a spin on the reels again. Get in his good books though and you could find a friend for life, and what a friend he could be as he has the power to deliver 10,000-coin jackpot wins! The structure of the Winning Wizards slot machine is as straightforward as they come with just 5 reels and 5 adjustable paylines on offer. The number of active paylines you use can be amended by clicking on the ‘Bet One’ button, and of course you’ll have to pay to have a chance of bumping into this mystical Wizard, but don’t worry it won’t cost very much. That is because you can stake from 5p up to £20 on each of the five paylines, thus enabling you play with all five paylines in play from 25p up to a maximum of £100 per spin, with the positive and negative buttons used beside to adjust how much you bet. Finally, you have a solid reason to say ‘Abracadabra’ aloud! For the amateur Wizards amongst you who are spouting the word without even knowing what it means, it’s what Wizards say when waving their magic wands to cast a spell in order to make the magic work, and while you don’t have to say it before every spin, you could well enjoy magical wins whenever you do so! The main himself, the mighty Wizard, appears on the reels with mischievous look on his face as he is about to wave his wand and bring you big rewards. He is the most valuable symbol you’ll see and landing him five times on a single line results in you scooping the jackpot prize of 10,000 coins. His magical wans, which has a large sparkling diamond at the end of it, is the next most valuable worth up to 5,000 coins. You will also get to read a few spells from his book of magic if you’re lucky with these bringing rewards of up to 2,500 coins. The magic potion he uses when casting his spells bring wins of up to 1,500 coins, the Wizards prizes ring which gives him almighty powers is worth up to 1,000 coins, plus there are King, Queen, Jack and 10 icons on the reels too. You’re probably wondering why I didn’t discuss which of the nine symbols are the Wild, Scatter or Bonus symbols and that’s because there are none. Yes, I was very surprised too. Despite this being a title which was released several years ago, hence the outdated graphics compared to the latest video slots, I still thought the Wizard would be the Wild and that there would be a pick me feature or a free spins mode, but nope. 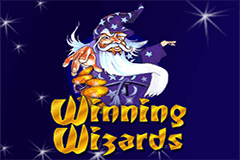 That is a factor which is going to put a lot of you off meeting the Wizard, therefore I would recommend the Win Wizard slot machine from Novomatic instead as it boasts much better graphics and slick bonus features that offer you the chance to win magical sums of money! The Winning Wizards slot machine feels like a spell that has gone wrong as it starts out so well but whenever you delve deeper and view the paytable, you quickly realise that there are no special symbols and there are zero bonus features – bitterly disappointing when the theme offered so many possibilities! For those of you who would like to mingle with Wizards and even more mystical characters like Fairies check out the Fortune Spells slot machine from EGT which will ensure you have a enchanting experience while enjoying magical wins.